With the arrival of virtualization and cloud computing, applications and services migrate back and forth across the network in response to the availability of and to ensure optimal use of compute, storage and bandwidth. In this world, the concept of the network edge has shifted, as east-west traffic becomes ever-more dominant, multiple tenants compete for resources, and cloud providers may not even know what software is being run on their servers. In this world, the servers within a datacenter cannot be considered truly secure. To complicate matters, the vast multiplication of connected devices and BYOD are placing extreme requirements for flexibility in access to network based services. Consequently, service providers want to build infrastructures that would as much as possible allow enterprise customers as well as end users to provision themselves in an easy to use yet centrally controlled fashion. SDN provides the tools to implement this infrastructure as an overlay on existing systems, and the Top-of-Rack becomes the point from which policy, security, automation, and service access is controlled. Unlike legacy network equipment, NoviFlow’s NoviSwitches have designed from the ground-up to deliver a networking fabric optimized for implementing programmable forwarding planes: very large table sizes, multiple tables, packet payload matching and traffic handling at line rate for even hyper-scale networks. NoviSwitches uses Network Processors (NPUs), which provide both high throughput and full programmability. When combined with NoviFlow’s NoviWare NOS, NoviSwitch provides a silicon-based forwarding plane that is 2 to 3 orders of magnitude faster than x86 processors, yet can deliver the fully programmable packet pipeline needed to provide both the agility and scalability required by today’s networks. NoviFlow switches implement the next generation networking technology – a programmable forwarding plane with match+action rules in a fully programmable pipeline, ideal for implementing intelligence at the network’s edge and top-of-rack. NoviSwitch programmable edge switches provide the full capabilities of SDN to optimize traffic flows by pre-processing them at the network edge, reducing the need for expensive proprietary appliances of software for WAN gateways, cybersecurity services, packet brokering, load balancing, and other data-plane intensive applications. NoviSwitch SDN switches have many advanced features that significantly reduce expenses by implementing remotely managed customer capabilities, and that enable transparent access to network services across domains using advanced tunnelling, and flow management capabilities. They also offer huge access control lists, advanced metering capabilities, load balancing, security mitigation, service chaining, filtering and flow handling and that allow users to provision themselves via a central site. 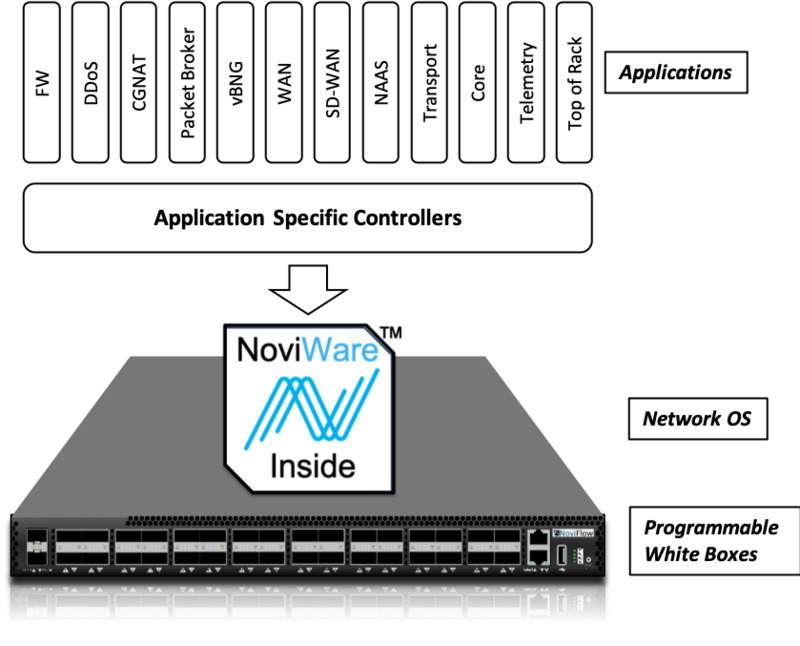 Also, each NoviSwitch runs the NoviWare Network Operating Software (NOS) which is field upgradable, so that new features and capabilities can be added via software upgrades, protecting the value and prolonging the useful lifetime of installed switches. NoviSwitches’ REST APIs provide a “feedback channel” that makes possible the direct integration of mitigation actions coming from network security and orchestration services into the forwarding plane, enabling a whole new level of network automation, including the possibility of responding to cyber-attacks in real-time. NoviSwitches deployed at ToR enable in-rack network policy enforcement, keep east-west traffic off of leaf-spine switches, accelerate the deployment of virtualization, NFV and vEPC.